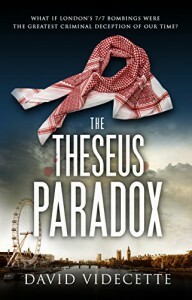 The Theseus Paradox is a fast paced and unnervingly believable crime thriller based on London’s 7/7 bombings of 2005. I’m not a big fan of crime and police procedural novels, but was attracted to this book because I used to live In Bradford, have family in Leeds and Dewsbury, and terrorism absolutely terrifies me, possibly even more than sharks, and I find them really scary! I have to admit that I was also lured in by the line “I can’t tell you the truth, but I can tell you a story.” Ooh, the intrigue. I give this book an overall 4 star rating, but the last 20% gets 5 stars, as does the epilogue and appendix, which also had me glued to my Kindle screen. I was dying to talk about it with my husband, but he was still reading it, so I had to keep my mouth shut, which was really hard. He too loved this book and gives it 5 stars. I am confident that this will be an easy 5 star read for many of my friends who are crime and police procedural fans. I highly recommend this to readers of those genres, as well as those who enjoy action thrillers, as I think many of you will love this. I will definitely be recommending this to anyone who asks for suggestions of great crime thriller books. If you’re still reading this review, and I haven’t sent you to sleep, then you really must check out this book! I would like to thank the author for a copy of this book, via THE Book Club (TBC) on Facebook, in exchange for an honest review, and wish him the great success this book deserves.